The U.S. House of Representatives has one voting member for every 747,000 or so Americans. That’s by far the highest population-to-representative ratio among a peer group of industrialized democracies, and the highest it’s been in U.S. history. And with the size of the House capped by law and the country’s population continually growing, the representation ratio likely will only get bigger. In the century-plus since the number of House seats first reached its current total of 435 (excluding nonvoting delegates), the representation ratio has more than tripled – from one representative for every 209,447 people in 1910 to one for every 747,184 as of last year. That ratio, mind you, is for the nation as a whole. The ratios for individual states vary considerably, mainly because of the House’s fixed size and the Constitution’s requirement that each state, no matter its population, have at least one representative. 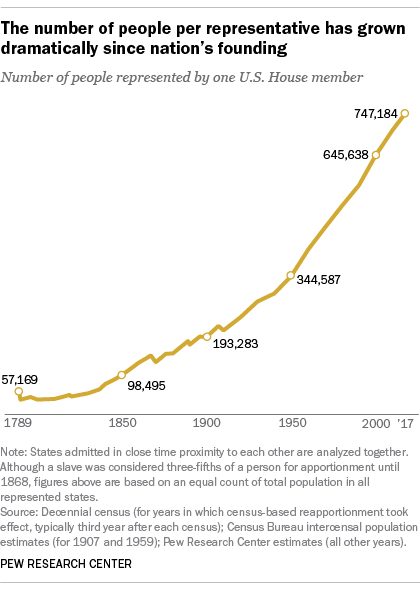 Currently, Montana’s 1,050,493 people have just one House member; Rhode Island has slightly more people (1,059,639), but that’s enough to give it two representatives – one for every 529,820 Rhode Islanders. There have been occasional proposals to add more seats to the House to reflect population growth. One is the so-called “Wyoming Rule,” which would make the population of the smallest state (currently Wyoming) the basis for the representation ratio. Depending on which variant of that rule were adopted, the House would have had 545 to 547 members following the 2010 census. However, a recent Pew Research Center survey found limited public support for adding new House seats. Only 28% of Americans said the House should be expanded, versus 51% who said it should remain at 435 members. When historical context was added to the question, support for expansion rose a bit, to 34%, with the additional support coming mainly from Democrats. 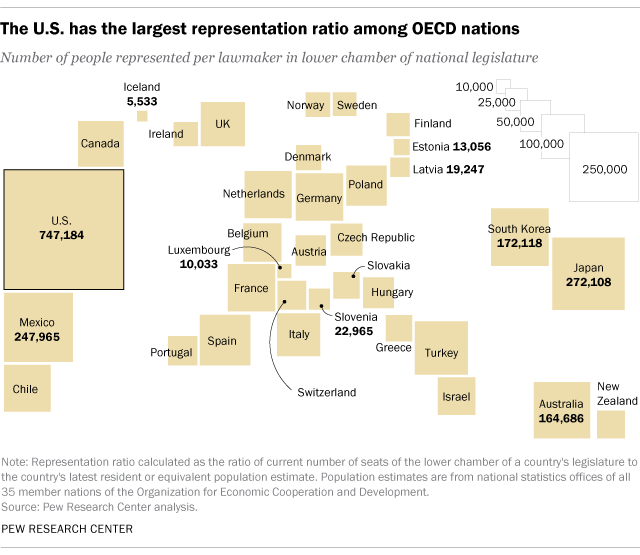 The House’s hefty representation ratio makes the United States an outlier among its peers. Our research finds that the U.S. ratio is the highest among the 35 nations in the Organization for Economic Cooperation and Development, most of them highly developed, democratic states.